Corning has been a trusted supplier to the healthcare and pharmaceutical industries since we introduced PYREX® glass in 1915. Today, we are a leader in laboratory products, cell culture solutions, bioprocess vessels, and specialty surfaces. We are also helping to provide more reliable access to medicine with our revolutionary new glass packaging for drug storage and delivery. With more than 100,000 customers, Corning products are standard equipment in nearly every Life Sciences laboratory in the world. Our product portfolio includes premium brands such as Falcon®, Axygen®, and PYREX®. Corning’s existing Life Sciences business is growing faster than the market and has more than doubled sales since 2009. We see continued opportunities to build on our leadership position in tools for 3D cell culture, bioprocessing, and genomics research. By drawing on our best-in-the-world capabilities and collaborating with long-time customers, we introduced Corning ValorTM Glass, a revolutionary glass packaging for medicine. Valor dramatically reduces the probability of contamination by particles, breaks, and through cracks, while significantly increasing manufacturing throughput. It enhances the storage and delivery of today’s drug formulations and provides more reliable access to medicines essential to public health. 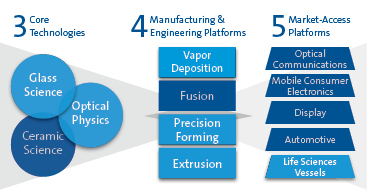 Corning remains closely engaged with its lead customers. As Valor Glass progresses through regulatory approvals, Corning is investing in high-volume manufacturing in order to deliver this technology to customers. Valor Glass has the potential to drive growth for Corning over a decade or longer. The current market for pharmaceutical packaging, plus the pharmaceutical industry’s spend to address glass quality issues, combine to represent a significant addressable opportunity for Corning. We are leveraging our deep customer relationships and core expertise to innovate and create long-term growth.